All-in-one Passive infra red outside light with CCTV camera, Security flood light, speaker & DVR system. A simple but effective product which deters intruders and is easily fitted. Simply connect to mains power, fix to wall and the built in DVR will record straight to the SD card supplied for complete peace of mind. 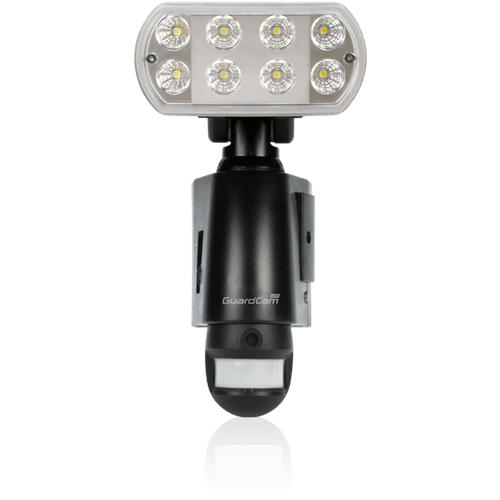 Due to the use of the latest LED technology the GuardCam LED security floodlight & camera consumes a maximum of 11 Watts power in full operation. The lamp array has an expected life of over 40,000 hours which equates to a 50 year average usage life of the product! -High resolution digital camera. GuardCams integral camera offers clear image recording in video or still frame format. Night images retain colour and clarity due to automatic LED illumination. -Built in DVR records directly to 2GB SD card. Up to 750, twenty second video sessions or 1500 still images are recorded onto the supplied 2GB SD card. Oldest Images are deleted and overwritten as the card reaches capacity ensuring recent events are always available. -A simple set up procedure will allow you to input the exact year, month, day and time that will remain within GuardCam ready to be applied to all recordings. -In the event of mains power failure internal back up batteries ensure the settings are not lost. -PIR motion detector with integral photocell. GuardCam detects the presence of intruders with proven PIR (passive infrared) technology at a distance of up to 12 metres from the unit. A photocell is employed to ensure activation is restricted to day or night operation at the users discretion. -PIR sensitivity and time control. GuardCams PIR can be adjusted to provide the best coverage whilst avoiding false triggers from passing traffic, animals etc. The time control adjusts how long the LED light will remain activated after the first trigger. -Audible alert speaker with choice of 3 warnings. GuardCam has the option to deliver one of three messages upon activation. Warning you are trespassing, Warning you are being captured on video and finally a barking dog (more effective than you may think). Theres also the option to have no voice alert. -3 mode selection. Mode selection allows the user to choose the most suitable combination of GuardCams functions. Light plus video at night,Â https://Â sound plus video in the day etc. -Secure waterproof recording control panel. The important SD card and time date controls are secured behind a waterproof door only opened with the supplied allen key. Electrical World Replies: Hello, we would always recommend this is installed and positioned in a way which leaves it not easy to tamper with. This fitting is designed to look like a light so the person doesn't think its a camera as such.